Oldest Building in North Carolina found in Edenton. I found using my webpage on a Smartphone not that easy. So I have made a very simple Android App which lets you go straight to the lists of dated buildings for some of the USA states. Enjoy! The Barnard Capen House is one of the country's oldest, most historically significant homes. It is also in pieces, dismantled and sitting in stacks in a storage facility in Norwood, waiting for a buyer to give it new life at a new location. It was every builder’s nightmare. Salisbury Cathedral’s original 13th century carpenters may have run out of home-grown timber for the roof because of a dispute between the chief carpenter Godardus and the warden of nearby Clarendon Forest which threatened wood supplies. The cathedral had to import trees from Ireland in order to keep pace with stonemasons building walls to support the vaults. Important advances in tree ring dating (dendrochronology) techniques carried out for English Heritage have allowed scientists to confirm that much of the oak timber used in the two exceptionally fine roofs of the eastern chapels was felled in the spring of AD 1222 in the Dublin area. This precise dating supports 1224 records of the dispute and the subsequent importation of wood from Ireland by a man called William of Dublin. The wood also bears out documentary evidence that the chapels were completed in 1225 and shows that their roofs were designed as an integrated whole - the same trees, or at least those from the same forest, appear to have been used in both. 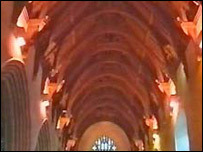 They are among the few remaining original roofs in the cathedral and some of the oldest in Britain. Peter Marshall of English Heritage’s Scientific Dating Service said: "The findings are among a raft of significant results to come from research commissioned for a programme of major repairs grant-aided by English Heritage and the Salisbury Cathedral Trust. They will greatly increase our understanding of major historic buildings and are likely to have a profound effect on how they are repaired in future." One of the most remarkable discoveries is that batten boards, used to support lead in the roof of the North Nave Treforium (described as "the most splendid medieval lean-to roof in any English cathedral") and the North Porch, were not post-Reformation replacements but part of the original 13th century fabric. Incredibly some have survived more than 750 years -even though exposed to the weather during the bleak Civil War years when the lead would have been stripped away. Dan Miles of the Oxford Dendrochronology Laboratory, who has undertaken the dating work for English Heritage suspected the boards’ very early date. He said: "In the past boards like this would have been disregarded because they were generally thought to be replacements for the old ones thrown out when lead was stripped. Dendrochronology is beginning to show more and more detailed information about the importance of such material." Analysis of the wood in the North porch roof, described by Dan Miles as probably the "jewel in the crown of all the Salisbury roofs", has revealed the earliest and one of the finest crown-post roofs in the country. The crown post was wrongly thought to have been a later addition. Here and on the east chapel roofs we find the earliest known use of Arabic as well as Roman numerals to mark timbers for assembly. Timber for the cathedral’s construction is known from documents to have come from as many as 16 different forests across Wiltshire and Hampshire as well as Herefordshire. Some trees were at least 300 years old when they were felled. One tree had a first ring date of AD 908. It is in Henry III’s Patent Rolls of 1224 that we read of a gift in 1220 of 40 rafters from Clarendon Forest. The timber was probably not collected until 14 March 1224 when the king settled the dispute between Godardus and the forest warden. The great oak west doors to the nave (12ft 4ins high by 6ft 5ins wide) are made entirely of boards from Irish wood, from the same area of Ireland as the east roof timbers. These and two doors to the Parvis Chamber (over the North Porch) are part of the 13th century fabric, not Civil War or later replacements as some writers have suggested. The dates established confirm that Salisbury, considered by many to be the epitome of Early English church architecture and the largest and most complete 13th century masonry building in Britain, was built almost entirely to a single design. The first foundation stones were laid in AD 1220 and the whole cathedral was completed before its consecration in 1258 - an astonishingly short time for such a structure. Tim Tatton-Brown, consultant archaeologist to Salisbury Cathedral who has conducted extensive research into its history and initiated the dating project, said: "This very important new series of dates from dendrochronology has given us, for the first time, an independent sequence of dates for the whole of the cathedral." The dating project is the subject of an exhibition being mounted by English Heritage in the Chapter House at the cathedral for National Science Week. This will be open from Saturday 8 March until Sunday 17 March from 9.30am to 5.30pm (Sunday from midday). There is no admission charge but donations to the cathedral are welcome. There will also be a lecture about the cathedral by Tim Tatton- Brown and Dan Miles on 14 March at 2 pm in Salisbury and South Wilts Museum, 65, The Close, Salisbury. Those wishing to attend should use city centre car parks. An historic mid Wales church has given up a 400-year-old secret thanks to new timber-dating techniques. A new report proves that timber used to build part of a mid Wales town's church did not come from a nearby monastery. The people of Llanidloes have long thought that the roof of the local parish church was built using timber taken and carried the 15 miles from Abbey Cwmhir. But a soon-to-be published report by scientists shows that timber used to build St Idloes parish church roof was cut after the monastery was closed by Henry VIII in 1536. This proves that the roof is post-dissolution and constructed for Llanidloes parish church and not re-used from Abbey Cwmhir." Earlier this year Dan Miles of the Oxford Dendrochronology Laboratory took timber samples from the nave roof and bell tower of the church as well as the old Market Hall in the town. The width of each ring was measured and compared to dated reference samples to discover when the trees that provided the timber were felled. "The dendrochronology shows that the tree used for the roof was felled in the late summer or early autumn of 1538," said Mr Miles. "This dating confirms the 1542 date inscribed on two of the carved angels on the roof. "This proves that the roof is post-dissolution and constructed for Llanidloes parish church and not re-used from Abbey Cwmhir." Timber used to build the church belfry was dated to about 1593. 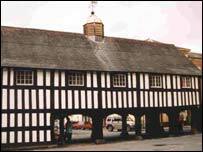 The old market hall was also sampled and the wood used for the posts was dated to between 1612 and 1622. But two other posts were dated to a much earlier date; one between 1540 and 1568 and the other between 1548 and 1578. "Clearly these have been re-used from an earlier building and incorporated in the present building when it was built in the 17th century," said Mr Miles. The buildings were investigated at the request of Dr Charles Kightly, who has organised a timber-framed building exhibition at the old Market Hall which opens in June. "These results quite clearly show that the roof of the church did not come from Abbey Cwmhir because nobody would fell timber for the roof of a defunct monastery," said Dr Kightly who believes the roof could be the last mediaeval angel roof built in Britain. The church belfry is the first one in mid Wales to be tested using dendrochronology. "The later Elizabethan period saw a growing interest in bells and bell ringing so it is interesting that the Llanidloes belfry dates from this period," added Dr Kightly.